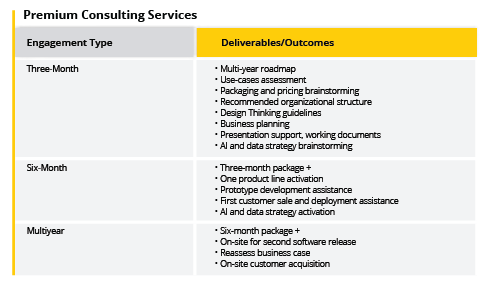 Have an expert on-hand to scope, plan, and accelerate new revenue projects. Our Strategy Consulting team will activate a proven business innovation framework for your company, unleashing the full potential of your combined data and domain expertise. A true partnership to launch your new analytics-driven business unit or revenue stream successfully. Sisense’s Strategy Consulting Service means having an industry-proven Chief Data Officer (CDO) on demand. Your expert consultant becomes an extension of your leadership team to create or accelerate projects leveraging data, analytics, and AI in optimal ways. Carefully scoped, designed, and aligned for your business model, capacity, and growth goals. Learn what makes a successful business unit. Get a reality check on your market potential. Differentiate yourself and market competitively with the right launch strategy, including packaging, pricing, and sales-channel activation. Optimize your internal assets and ensure your teams are ready to deliver results fast. Create an iron-clad business model to meet your revenue goals and ensure long term growth. Charles is a business innovation executive with proven success in developing impactful strategies for business teams to deliver results from the Sisense Data and Analytics Platform. As the founder of Sisense’s Strategy Consulting Service, he is your CDO-on-demand, helping create or accelerate the creation of new business units by leveraging data, analytics, and AI. Develop your go-to-market strategy, build new analytical OEM product lines, and accelerate your BI journey. or ongoing multi-year engagement to ensure sustained success. Ready to take your analytics strategy to the next level? For more information or pricing on the Sisense Strategic Consulting Service, please contact your Sisense Account Executive (AE) or Customer Success Manager (CSM).